RFPs often ask for the sun, moon, and stars in 10 pages. 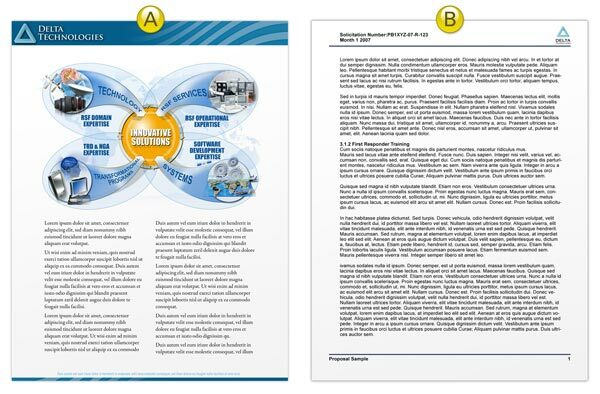 The challenge we face is when, where, and how do we add graphics to a 10-page proposal (that should be 40 pages to effectively answer the RFP). Graphics are easier to understand. Your audience is human. You may have the best solution, but they may miss or misunderstand a critical element. Evaluators and decision makers are distracted, tired, overworked, and often take short cuts to help them decide who should win. Make it easy for them to quickly understand your solution. Include features, benefits, and discriminators. Graphics communicate up to 60,000 times faster than text alone and increase our understanding of the presented material and our recollection of the information by at least 38% (according to independent research). Graphics communicate complex concepts quickly. What is easier to understand: a textual explanation of an organizational structure or an organizational chart? Can you imagine trying to textually explain the following chart? Graphics quickly say more than words alone. Graphics communicate your company's commitment, quality, and the importance you place on working with your future client. Anyone can write a proposal. Few can write a great proposal. Fewer still allocate the time, thought, and money into developing a compelling visual representation of their solution. A clear, communicative, professional graphic tells evaluators and decision makers that you care and shows you have more resources (than your competitors) at your disposal. Graphics also demonstrate that you are committed to solving their challenge. The quality of your graphics subconsciously communicates the professionalism of your company. Graphics make it easy for you to stand out from the pack. Looking at the following proposal pages, which is the better company—A or B?" Graphics can lower the perception of risk. We trust that which is familiar. As Robert S. Frey, author of Successful Proposal Strategies for Small Businesses, says, "Our audience wants to see themselves reflected in our proposals." Based on this belief, which slide would be more appealing to the U.S. Army—A or B? Don't get me wrong. I am NOT saying graphics are better than text. I'm saying that graphics and text work together to better communicate your solution in a way that is more compelling and far easier to understand and remember. Let's move on to the when, where, and how to use graphics in page-limited proposals. Your solution is complex. Often a graphic can communicate complex concepts more succinctly than text alone. Consider network diagrams, quantitative charts, dashboard graphics, Gantt charts, organizational charts, and process diagrams. All communicate complex information that is easily digested. You want to ensure your information stands out. Good graphics pull our eyes to them because, to simplify the explanation, they look different than the text around them. Visuals communicate faster than text because text is decoded linearly and graphics are absorbed all at once. Graphics are instantly stored in long-term memory whereas text must go through short-term memory before they are stored in long-term memory. You want to quickly communicate the professionalism and commitment to the project. As stated earlier, graphics show you care and speak to the quality of the service/product your company provides. Anywhere they are needed. The golden rule is a graphic per page, but I have found it unrealistic to shoehorn a graphic onto every page despite tight budgets and page limitations. Place your graphic as close as possible to the associated text. There are a few secrets to ensure your graphics are clear, compelling, concise, and as small as possible. First, let's focus on clear, compelling, and concise. Know the graphic's primary objective (P). What is the purpose of your graphic? It should never be "To win the proposal." The primary objective should be client focused. For example, a clear primary objective could state, "To show how our solution solves our future client's problem." Alternatively, your objective may be to explain a complex concept critical to the win. If relevant, tie features to benefits and discriminators. Your primary objective may read, "To show the new system architecture and why it is better." Know your audience (A). What are their challenges? What are their hot buttons? What do they care most about? Your graphics should focus on your future client's wants and needs. Include graphics that help them choose you. Know the questions (Q) that need to be answered to achieve the primary objective. Refer back to the primary objective. Your primary objective is "to show how our solution solves our future client's problem." Imagine meeting your future client at an event. You say, "Boy, our solution can solve that problem of yours." How do you think they will reply? Perhaps they may ask, "How?" Your graphic should answer the burning questions related to the primary objective. Know the subject matter (S). To correctly answer your audience's questions, you need a clear understanding of the presented topic. If you do not understand, how can your audience understand? You need to answer their questions quickly and with a thorough knowledge of their business, issues, and requirements. Successful graphics have a primary objective, are audience-focused, and answer your audience's questions (as they relate to the primary objective). All other graphics are confusing and detract from your proposal. Next, how do you make graphics as small as possible without sacrificing quality (or compliance)? Step one is to know the P.A.Q.S. This process guarantees that extraneous information is purged so the graphic is to the point. Exclude extraneous words and descriptors. Change "Our Systematic, Quality Evaluation Process" to "Evaluation Process." Use known acronyms. For example, "quality control" becomes "QC." Use a sans serif, narrow font like Arial Narrow. (If your document does not embed the font, make sure the end user has the font.) Sans serif fonts are cleaner looking and easier to read for short chunks of text and small sizes. Narrow fonts shorten the width of each character, which allows more content in the same space. Decrease line spacing. For page-limited proposals, I recommend using a .85 multiple line spacing in Microsoft Word and PowerPoint and the same line spacing as font size in Adobe products (for example, 10-point line spacing for a 10-point font). Delete extraneous imagery. If an image quickly communicates information, keep it. If, however, the image merely supports the information, delete it. You now know the three tips you need to increase your chances of success on your next page-limited proposal. Practice makes perfect, so be sure to remain vigilant and use these tips until they become habit. Mike Parkinson, PPF.APMP, is an internationally recognized visual communications expert and APMP Fellow. He is a partner at 24 Hour Company (www.24hrco.com) specializing in bid-winning proposal graphics. His Billion Dollar Graphics web site (www.BillionDollarGraphics.com), "Billion Dollar Graphics" book, and Get My Graphic website (www.GetMyGraphic.com) share best practices and helpful tools with proposal professionals. Contact Mike at mike@24hrco.com or call 703-533-7209. If you don’t have your own FREE subscription to Design To Win, sign up now at http://www.24hrco.com/newsletter.html. Join more than 2000 other proposal professionals who get answers to their most pressing issues and challenges from recognized industry experts—every other month. Plus you’ll have access to all back issues and our growing library of proposal resources.